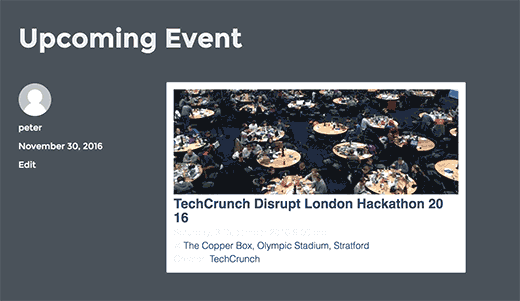 Do you want to display Facebook Events on your WordPress site. Facebook events allow you to promote your events while leveraging the power of the world’s largest social network. 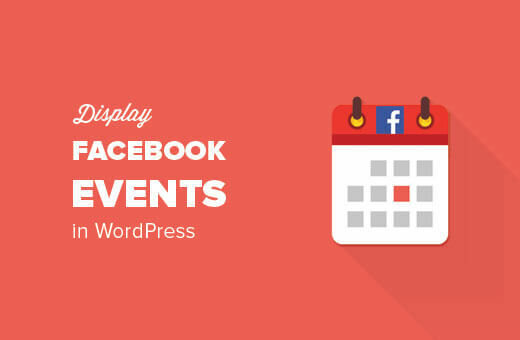 In this article, we will show you how to display your Facebook Events on WordPress. This method uses Facebook’s social plugins to add your Facebook events on WordPress. You will need to edit your WordPress theme files. If you are not comfortable with adding code manually, then try other methods described in this article. First you need to visit the Page Plugin on Facebook developers website. In the Facebook Page URL field, enter the URL of your Facebook page. Facebook page plugin can show multiple tabs from your page including the events tab. Simply enter ‘events’ in the tabs field, and you will notice the preview window reload to show your page’s events tab. You can also adjust other settings like cover photo size, container height and width, etc. Once you’re satisfied, click on the ‘Get Code’ button. This will bring up a popup showing two boxes of code. The first part of the code needs to be added into your theme’s header.php file right after the <body> tag. Next, you need to copy the second part of the code and paste it in a WordPress post, page, or a text widget. That’s all you can now visit your website and you will see Facebook Page Plugin showing your page’s events. This method allows you to add Facebook Events in WordPress without adding any code to your theme files. First thing you need to do is install and activate the WP Embed Facebook plugin. 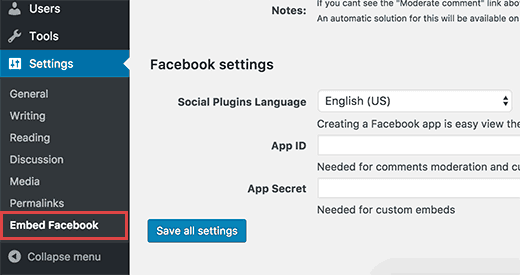 Upon activation, you need to visit Settings » Embed Facebook page to configure plugin settings. The settings page for the plugin is divided into multiple tabs. You will land on the ‘Magic Embeds’ tab. Scroll down a little to the Facebook settings section. 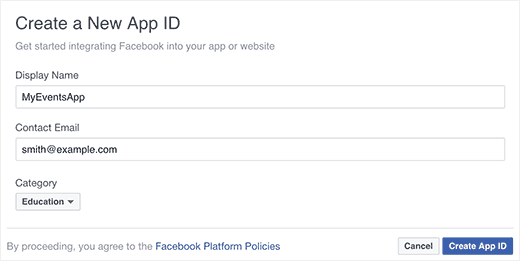 You need to enter a Facebook app ID and secret keys. You can obtain these keys by visiting the Facebook Developers website and creating a new app. This will bring up a popup where you will be asked to provide a name for your app and choose a category. Facebook will now create your app, and you will be redirected to the app dashboard. Click on the settings link from the menu on your left to view app keys. Now you will see your app ID key and secret key which will be hidden, and you will need to click on the show button to copy it. Enter both keys in the respective fields on WP Embed Facebook plugin’s settings page for your WordPress site. Don’t forget to click on the ‘Save all settings’ button to store your changes. Don’t forget to use your own Facebook page URL in the shortcode. This shortcode will display the Facebook Page plugin with only your Events tab. You can now visit your website to see it in action. You can also add the shortcode to a text widget. But before you do that you will need to enable shortcodes for your sidebar widgets. Some users may need to share a Facebook event created by their personal profiles. These events are not associated with a page. Here is how you will show them using the custom embeds feature of the plugin. Replace the URL in the shortcode with the URL of your Facebook Event. 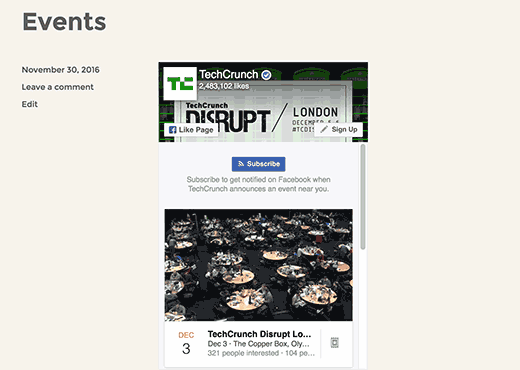 You can now preview your website to see the Facebook events embed in action.